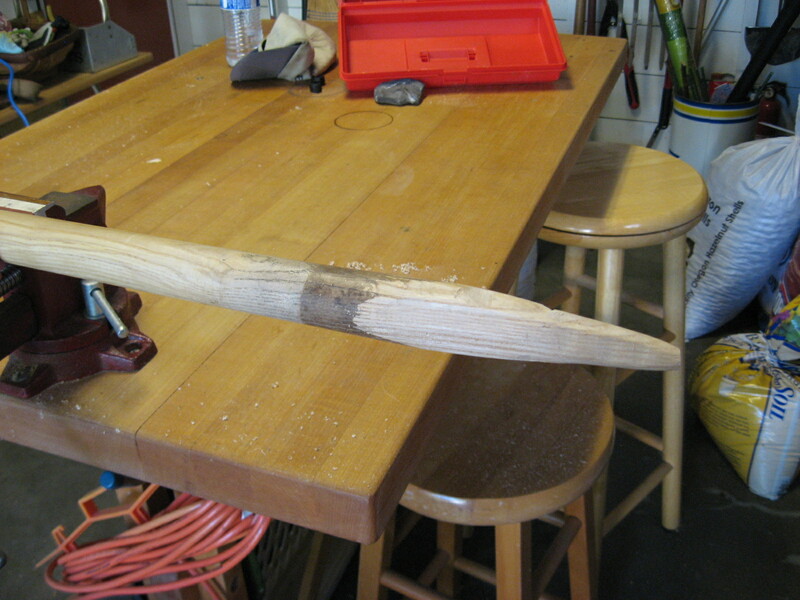 Just scanning the pictures, I thought you were making props for Run-DMSteve the Vampire Slayer. After reading the text, I know you are actually Run-DMSteve the Plant Saver. You couldn’t use my stake to kill a vampire, but you could use it to waste that idiot Bella! Steve–Nice to see that you’re doing some productive work. 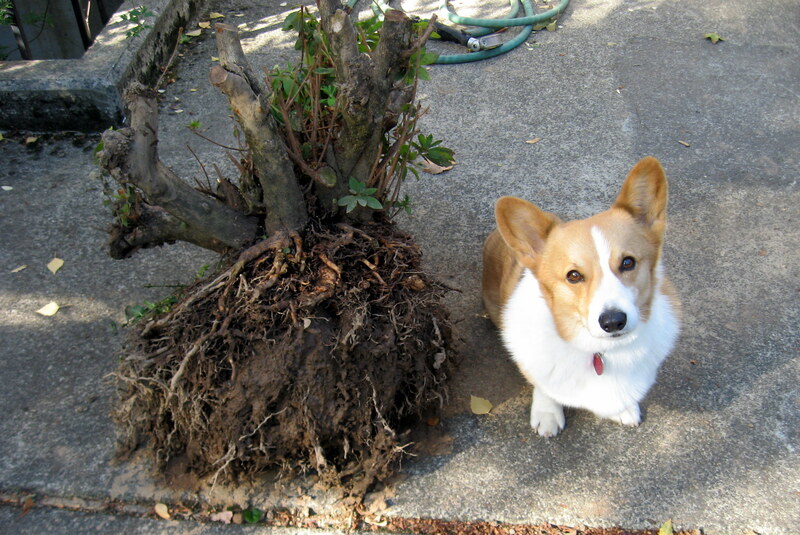 Though it is a little bit squirrely to take credit for the stump removal in 2009 that was mostly Teddy’s work (evidence the bite marks). And you might have your recycling priorities topsy turvy. 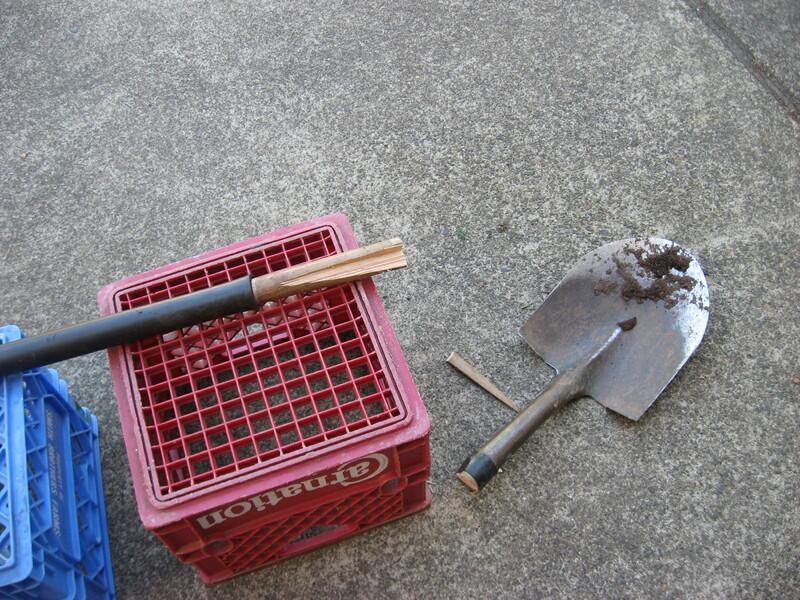 You KEEP the blade of the shovel and buy a new handle to put into it (after carefully burning out the remains of the old one in your handy, backyard burn barrel). And be sure to treat the end of that newly made stake with some strong, poisonous compound so that it has a chance to outlast the new handle you buy for the (never to be discarded) blade. 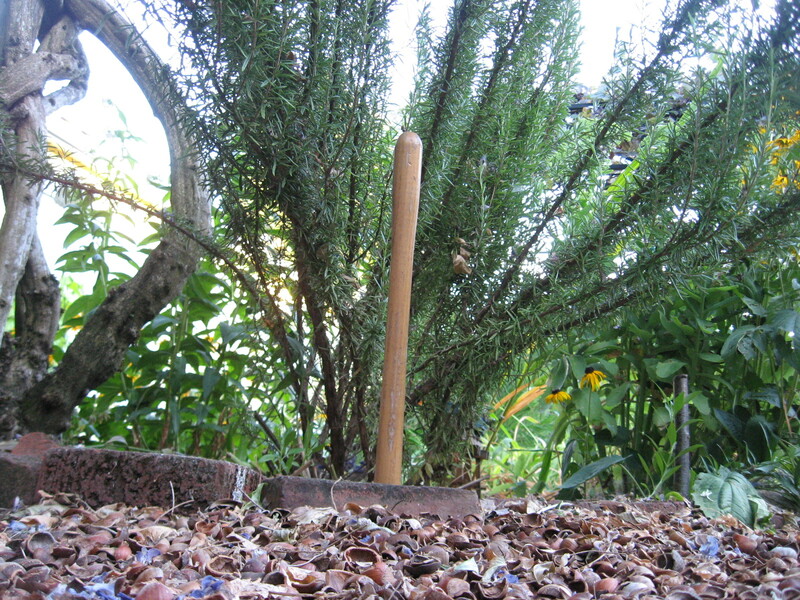 I suggest that you increase your repertoire of tools by adding a quality mattock and/or adze to the mix. Question: When is a shovel a lever?? 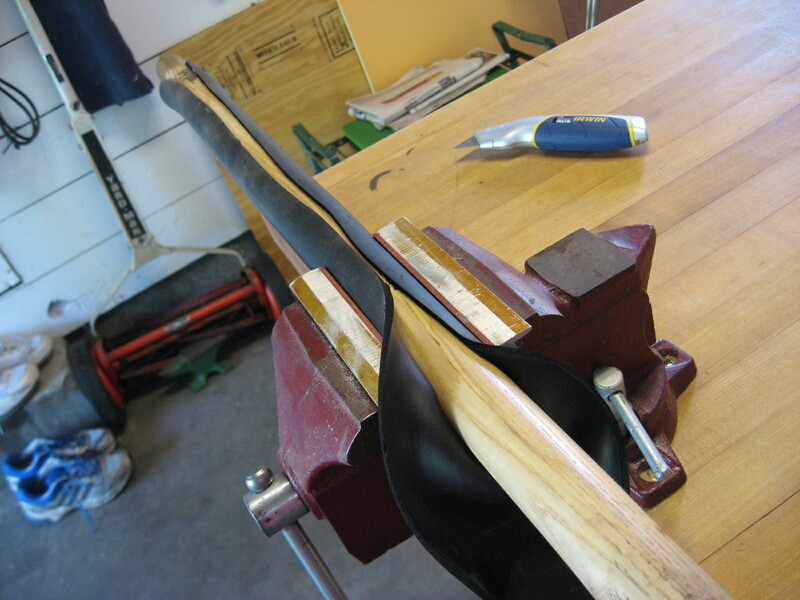 Answer: When tool abuse becomes a lawful practice. As Mr. Natural says: “Use the right tool for the job!” I’m not trying to appear all high and might here…I broke the handle of my razor clam (siliqua patula) digging tool after 25 years of use, and I freely admit that I was using it improperly in its final hour. I still have the blade…never dispose of (or depose) a good friend. PS–I do admire your appreciation for the fine, old woods of yore. 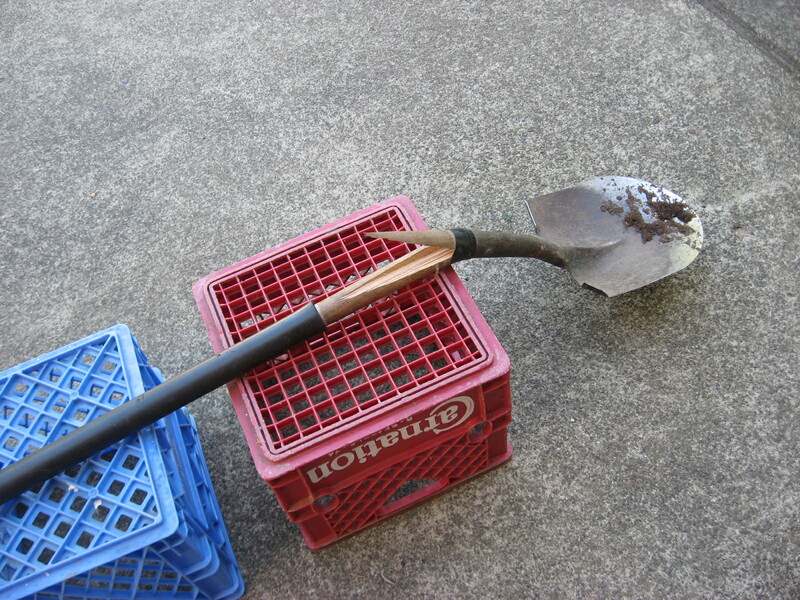 I’ve also found that long-handled shovels make great levers! You just have to know how far to push the levering. In the case of the vine maple, I could only get to it from one side. This gave the shovel too much to do. It was my mistake, and upon reflection what I should’ve done to the damn stump was set fire to it, although this would’ve upset the neighbors and probably also my wife. When I donated my old laptop to charity, I felt like I was abandoning an old friend. But I did it anyway. Teddy was such a big help in the 2009 stump removal, I finally had to put him in lockdown to stop the barking! At one time I owned a 9- or 10-foot long, approx. 1 1/4-inch diameter, 6-sided metal pry bar typically used in certain aspects of concrete work. I employed it a few times for various projects. Finally, it felt so damn heavy just taking it out of the garage that I set it out by the curb and someone hauled it away for free. If I had known you back then and knew of your penchant for stump removal, I would have gladly delivered it to your doorway. You could have probably pried out a fully grown, Big Leaf Maple tree using it. I did not realize that there is such a ‘divide’ over the discard or save issue pertaining to shovel parts (their use as a lever or NOT is a separate issue). I have the view that differences of opinion are just that and nobodies opinion accurately reflects ‘what is,’ nor prescribes the necessary action(s) to be taken in any given situation. I will not be discarding (nor recycling) you as a friend over any differences that we may have regarding these shovel issues. In fact, I openly invite you to borrow my 6-foot long, vintage car axle shaft, which my dad used as an all-purpose lever, whenever you need it for your prying ways. You might also check with your father to see what he has available within his vast inventory of STUFF. You owned a 9- or 10-foot long, 6-sided metal pry bar?? Are these things even available to civilians? I try not to own any tool that weighs as much as me. As for your vintage car axle shaft — Mr. Seaside, your father was a man among men, a boulder among rocks. PLEASE don’t bring that thing over to my house. I’m not worthy. Regarding discarding vs. saving, I wrote that I’m a New Englander, but a classic New Englander would’ve followed your method and attached a new handle. I guess then that I’m a New Wave New Englander. Differences of opinion may be just that to you and me, but in the rarefied world of political commentators and talking heads with perfect hair, these differences are everything. Meanwhile, thanks for not discarding or recycling me. I promise not to push, file, stamp, index, brief, debrief, or number you.